Camp, canoe, kayak, hiking, and more! This remote site offers 5 nonfee primitive campsites and is only accessible by watercraft. 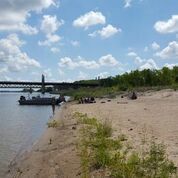 It is located on the South side of the Missouri River, adjacent to the Corps of Discovery Bridge.